I have been building some noisemakers using cardboard as pcb. It´s a nice material for building electronic projects at home because: 1. everybody may not have the needed equipment to make "real" pcb:s 2. every one has a piece of cardboard laying around. 3. It is cheap and easy. This is my latest creation on cardboard pcb. It´s wp-20 sound effects synth. 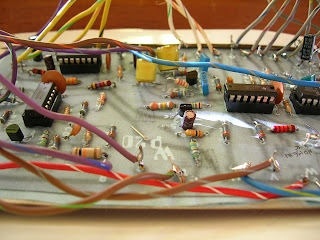 It was very nice to do on cardboard because there was enough spce between components in the original pcb design. I did´t use the original noise source with 18v but i built a simple 9v noise generator. I left q1, r1, c3 unconnected to the board. here is the noise circuit. 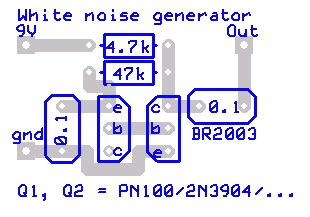 output of the noise generator was connected to r3 through 50k resistor.